What Have They Done To Oatmeal?!?!? Oatmeal – Known to be one the best choices for breakfast. Has recently been trumpeted by the fast-food industry as evidence of their attempts to present the public with “wholesome” food. Once gain, BUYER BEWARE!! So when McDonalds recently started serving oatmeal it perked a few ears up. In a recent article in the New York Times, Mark Bitman attacks Mickey D’s pointing out how they took a natural meal item and added their own ingredients. 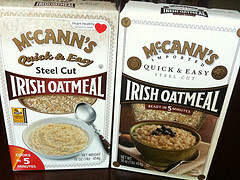 This more than doubled the calorie, fat, carbs, cholesterol, sodium and sugar content in comparison to natural instant oatmeal. Several months ago Starbucks rolled out their oatmeal. After reviewing their nutritional information what we found was that as long as you don’t add any of the items they also give you (in separate pouches) then they are very comparable to the natural oatmeal you should be eating. The troubling part about McDonalds is that they don’t give you that option. So as always. We all have decisions to make. What are you going to decide to put in your mouth for breakfast? What healthy alternatives have you found? How do you spice up your eating plan? The BIG game is upon us. What are you going to serve? There seems to be a misunderstanding about some of the foods involved. Yes there are plenty of BAD foods. But there is also the inevitable silver lining. Yes, I’m talking about Guacamole! Guacamole in some circles gets a bad rap. Isn’t it high in fat? High in calories?? Let’s talk first about the nutritional benefits of Avocados. Avocados are the basic ingredient of guacamole. About 75% of an avocado’s calories do come from fat. But most of that is monounsaturated fat. Avocados also have 60% more potassium than bananas. They are rich in B vitamins, vitamin E and K.
High avocado intake has been shown to benefit cholesterol levels. Lowering LDLs and raising HDLs. And by the way this is due to its high level of monounsaturated fats. Now the bad news. Yes the calorie count is something to take notice of. 1 tablespoon of guacamole dip has 94 calories while a whole cup (how can you eat just one tablespoon) has a whopping 1500 calories. 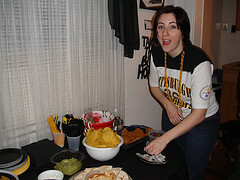 So if you’re going to indulge in dips while cheering on your favorite team. Pass the guac and the leave the other dips for everyone else. A special thanks goes out to Al for inspiring this blog.